While safety should be a concern to everyone on the job, simply telling workers that they need to follow established policies set by management may not be the most effective way to get the message across. Sitting in a meeting to listen to accident statistics or learn about new procedures can be boring to employees. "Falling objects can be brutal, so wear your hard hat to protect your noodle." "A spill or a slip could mean a hospital trip." "Working in a safe way means you will live to see another day." "If you mess up, don't hesitate to 'fess up." "Take a shortcut and you will be cutting your life short." "If you don't want to bet your life, don't gamble with safety." "If you are in favor of safety glasses, Say:'Eye'"
"It's better to arrive late in this world than early in the next." "Don't be afraid to ask a dumb question. It's a lot easier to deal with than a dumb mistake." "If you don't want your wife to spend your 401(k), don't get hurt on the job today." "Remember: Safety is not an accident." "Remember to work safe today. Heaven can wait." "Your first mistake can also be your last." "Remember your safety ABC's: Always Be Careful"
Once a person loses interest in what is being presented, they are less likely to take in the entire message. If they can become engaged with the message because it strikes them as amusing, it is more likely to stick with them after they hear or see it for the first time. 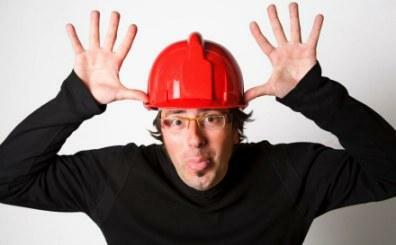 Safety at work is not something that workers can be exposed to once and no further information or follow-up is needed. Instead, it is a concept that should be focused on and discussed often. Using humor to do so can capture the employees' interest and keep the message fresh. These are just a sample of some funny workplace safety tips that can help workers avoid being injured (or worse) on the job. When people get hurt at work, it costs employers in productivity and increased costs for workers' compensation and other benefits. Employees are affected too, since a job-related accident means lower morale. It could also mean that available work must be done with fewer staff member. Avoiding the accident or injury in the first place is a much better approach, and using humor to do so is a very effective method for helping people stay safe.